iTunes-start is slow if you have a large media library. You would like to know about options for tuning and efficiency. The bigger the music data bank, the slower the iTunes. This becomes especially apparent on the older computers or with slow hard disks. 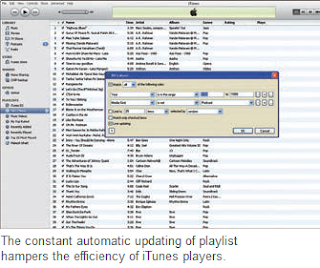 Although a practical function, the intelligent playlists add to the delay, as iTunes updates all lists during every access. Therefore consider which of the lists are really useful and required. In case of other lists, you can right click the desired entries and delete them by means of the context command bar. If you wish to retain the list, it is logical to configure its settings. Use the context command bar “Edit Playlist” or simply right click on the Playlist. Here, deactivate the option “Update automatically”. If a list is constantly used, you can limit its size for improving performance during automatic update. For this, activate the option “maximum” and set the limit to say “25 objects” or “100 MB” next to it. Confirm your settings with “OK”.